Since the 1950s, sea level in and around the Maldives has been rising at a rate of 0.03–0.06 inches (0.8–1.6 millimeters) per year.7,8,9 Because of the Maldivian topography, small changes in sea level translate into extensive land inundation. Only 11 percent of the Maldives' inhabited islands had potable groundwater before the 2004 tsunami in the Indian Ocean.10,11 Transient seawater inundation during that event contaminated these groundwater supplies as well as soils. 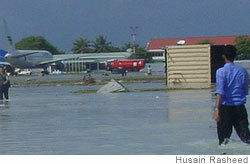 Migration is also a potential solution for Maldivians. In November 2008, the president announced the country's interest in buying a new homeland,20 though this approach would come at a high price, both financially and culturally.